If you follow Decanter on Twitter you will have seen a hashtag recently, something like – #idrinkfabulouswineandyoudont – under which people posted pictures of their Xmas drinks. No one was drinking £4.99 bottles from Morrisons or the local off-licence. Instead first growth claret, fine burgundy and old vintage port featured. Well, nothing quite like that in Sutton Coldfield. For various reasons (pregnancy, driving) little wine was desired and there were a few beer drinkers as well. Nevertheless a few bottle were opened, pictured. As ever, no notes taken whilst drinking. The Ten Minutes by Tractor McCutcheon 2010 is an old favourite – last bottle unfortunately. Pure fine pinot bouquet and flavour which lasted well into the evening. From Lay and Wheeler, about £40 which is undoubtedly expensive but see some of our earlier posts on burgundy at similar prices. I bought the Quinta da Manuela 2001 (£18) over three years ago following an excitable email from the Wine Society which talked about a rare opportunity to acquire old-(ish) wine from the Duoro. I’ve learnt over time that these offers are often not quite the bargain they are made out to be and initially I thought this one would be the same. The first couple of bottles were dull and clumsy. But on Christmas Day, with roast pork, the wine was superb. Like a classy old Rioja in style – different grapes of course. Finally a manzanilla from my favourite bottler, Equipo Navazos, who have featured here several times. This is number 32 (a bin end, I think, so only £20) from Darley Abbey Wines. They still have a few bottles left. Still beautifully fresh with a saline tang, despite bottling in 2011. Indeed the producers think it will age well. Let’s hope so. There are so many champagnes being used as customer attractors this Christmas. Another type of fridge magnet, perhaps? I wonder what the producers think of it. They have spent a lot of money, over decades, maintaining the image of their sparkling wines as a premium product but now it’s brand-promoted with huge discounts. I wonder what’s driving this? Commercial pressures, no doubt, but where? The growers, producers or supermarkets? 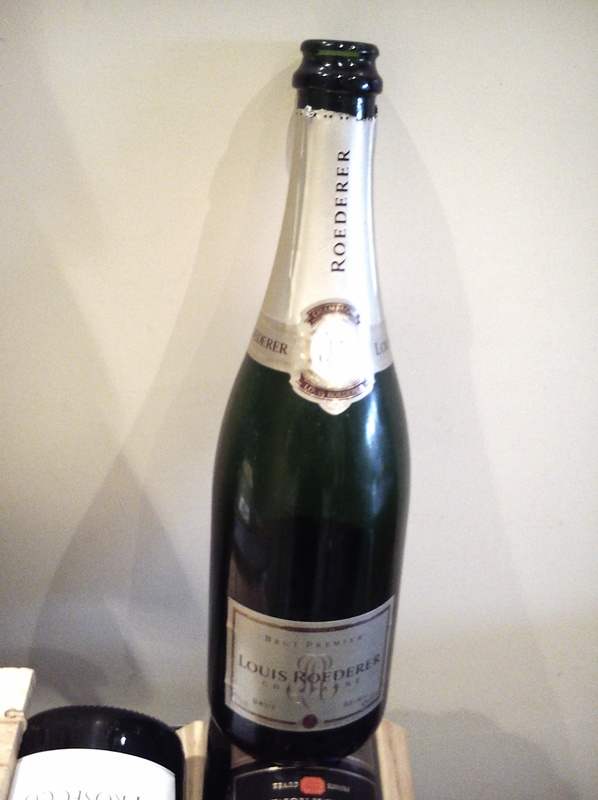 Some brands keep aloof, however, and Louis Roederer is one of those. This bottle was bought for me by my daughter about four years ago. It’s an NV Brut of 12% ABV but does it justify its premium (for ‘ordinary’ NV) price tag? In the glass it appeared very pale green, rather than lemon, coloured with fine, persistent bubbles. The nose was light and fresh but certainly not yeasty, suggesting subtle rather than the obvious. The flavour was wonderful; rich, soft, with a long finish and a gentle mousse which conjured up refinement and gentleness. There was also an intriguing slight smokey quality to the taste. Evidently, LR use all their own Pinot Noir and Chardonnay grapes in this blend but buy in the small amount of Pinot Meunier also used. This champagne certainly does justify paying that bit extra, in my opinion. Wine is a symbol of middle-class taste – well at least according to Aldi and Lidl. Their notable efforts to attract more – and different – customers has resulted in offers of wines that have been quite eye-catching. 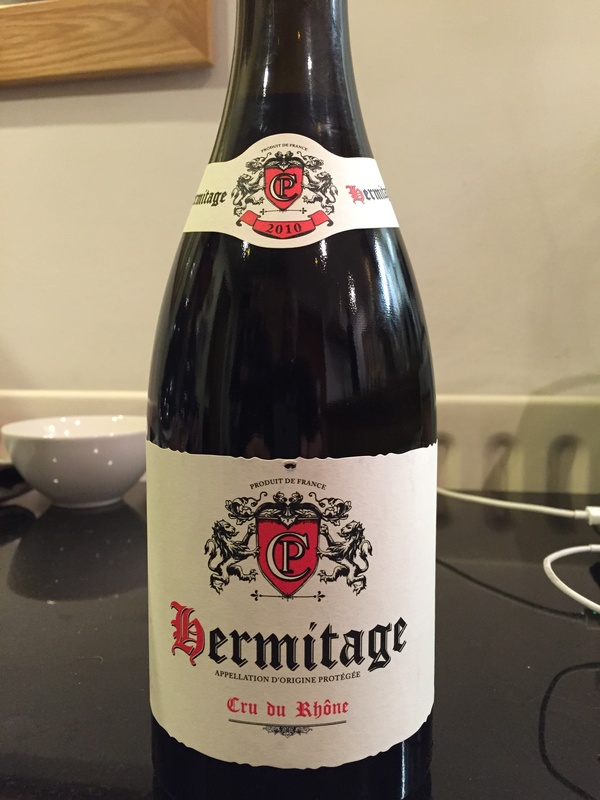 I was browsing the wine shelves in Aldi and noticed their Hermitage 2010 at £19.99, made by the co-operative at Tain. An ideal wine for our tasting evenings and this blog. Colour – dense, black with a garnet rim. Some legs. (it’s 13% ABV). Nose – not particularly forward or fruity but Richard identified the low notes of laurel. It’s 100% Syrah. Palate – smooth, gentle tannins. It has immediate, big dark fruit appeal but the middle/back palate fades quickly and it’s short (This wine had been open 2.5 hours – but we expected a Hermitage to stand that). Overall impression: . It depends on what you want to do at Christmas, impress with your knowledge of French wine areas or amaze with the quality of wine in the glass. £20 for the Hermitage label is great value, £20 for this red wine is poor value. Comments Off on Aldi – good value? For this rare French grape I’m tempted to start with the Edith Piaf lyrics ‘….je ne regrette rien’, but I will – regret it, I mean. Sorry. Right, this is the dominant grape of the AC Cote de Frontannais, a small appellation south east of Bordeaux and north of Toulouse. It’s also grown in California but this wine comes from the Loire Meridionelle and is a VdP de Vendees i.e. an area close to the mouth of the river Loire. 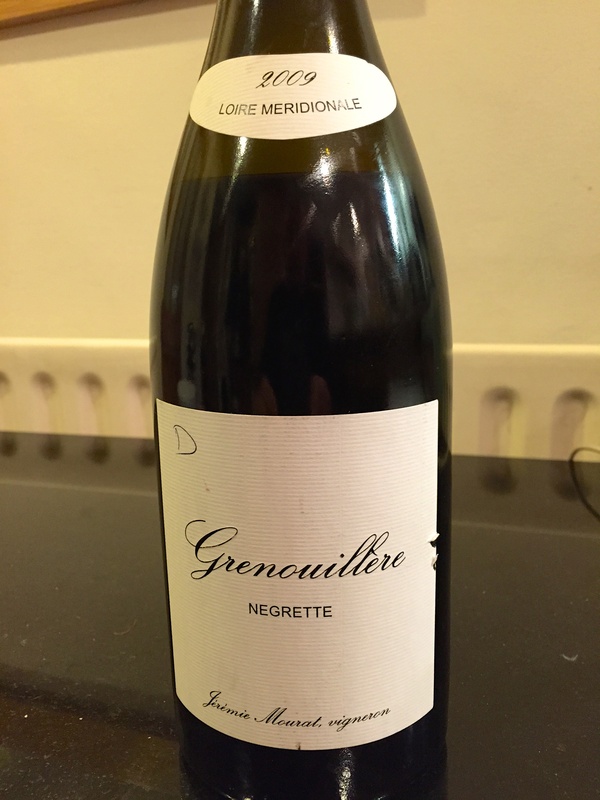 It’s Mourat’s Grenouillere 2009. The colour is a dense purple, almost black but still has a purple rim. The bouquet is one, fleetingly, of spice and fresh raspberry fruit a la Cabernet Franc but mutated into a more southern French smell of grenache – all dark fruits and plummy. The palate belied the rather big fruity nose being quite gentle and smooth, almost delicate with low tannins but a good mouth feel. It also had the medicinal cough mixture taste (not in an unpleasant way); just one element that stood out in a beguiling, complex wine. We both liked it but whether we’ll taste one again, I don’t know. The grape is difficult to grow, evidently, being rather susceptible to disease but I will be looking out for AC Frontannais, just to have another try. The dense black core was trimmed with a brick coloured rim and the nose was attractively medicinal, aromatic and spicy at the same time as having woody overtones. The palate was sweet , almost port-like, with lots of dark red fruits. 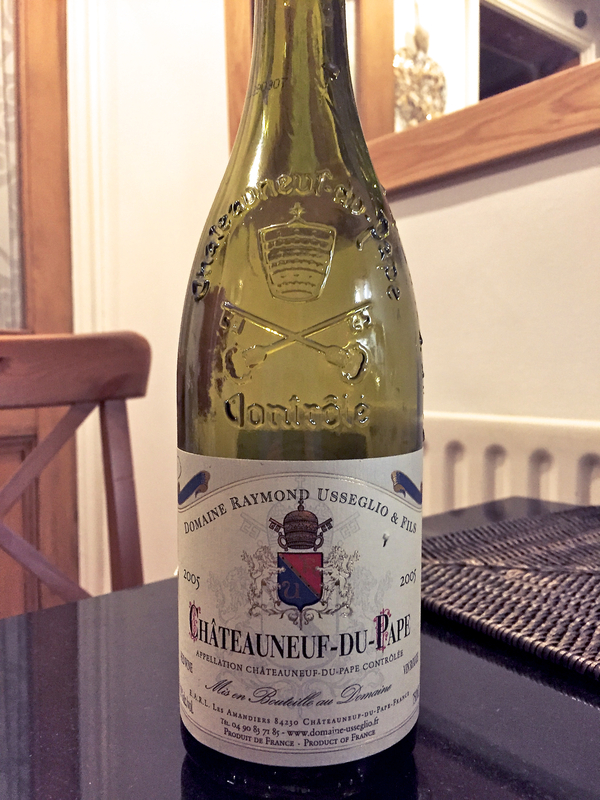 There was some acidity but not very pronounced and it was soft with low tannins so we estimated that now was the best time to be drinking it – and possibly it might have been better slightly younger. It was still a big mouthful of flavour but only had a medium length. Having now aged ten years plus, we thought this a good wine but whether it matched the description of the vintage as judged by BBR, well – that was harder to say. The origin of the phrase ‘lunchtime claret’ is obscure but it is redolent of London clubs, steak pie and the type of person whose afternoons could be spent snoring gently away in the arms of leather chair whilst the clock ticks time away in a cigar smoke haze. (Richard, how about that for a ‘flight of fancy?). 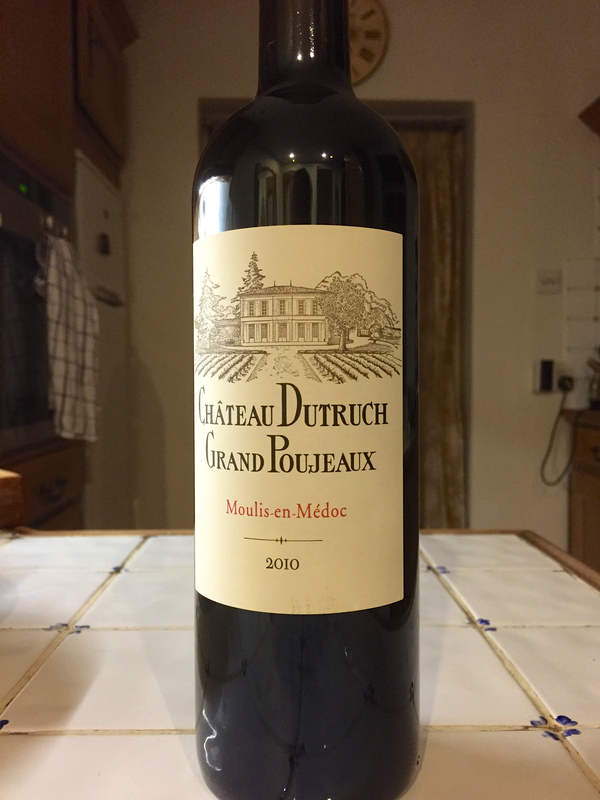 Chateau Dutruch Grand Poujeaux 2010 (WS £12) is from Moulis-en-Medoc, a wedge shaped district running inland from the south bank of the Gironde estuary. It’s 13.5% ABV, which means the post-prandial snooze may go on longer than expected. A blend of equal amounts of Merlot and Cabernet-Sauvignon, the balance being 6% Petit Verdot. Dense black in colour there was still the purple rim traces of immaturity in the glass. The nose was fresh and quite fragrant – perfumed, even – with some traces of blackcurrant. On the palate, it had some sweetness and tannins but finished nicely dry. There were some light tannins and full flavour but it was somehow a bit hollow in the middle, but pleasantly smooth. This was a rather undemanding, inoffensive wine; and as nice as anyone who is cat-napping in an armchair in the mid-afternoon. 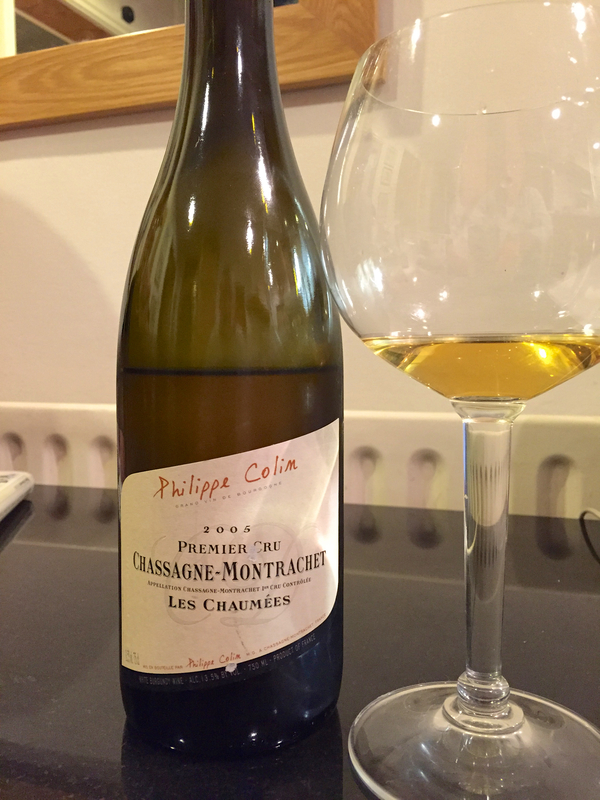 Richard, ever the generous host, recently opened an ’05 Chassagne Montrachet which we reviewed not long ago. It was oxidised. This bottle is its identical twin. Visually, it was an attractive sparkling gold, clear and bright with some viscosity. So far so good. The nose would be crucial – oxidised or not? Not. This had a lemon sherbet (thanks Richard) bouquet, not overpoweringly citrus but lightly so – which accompanied a slightly hazel nut aroma. This was now promising. The taste was of a big, rich dry wine with some acidity – all of the primary flavours were present. But it lacked finesse. It had an uncomplicated style; one would almost describe it as simple and, it must be said, slightly disappointing for that. We both were pleased about the lack of oxidation so everything else was a bonus. The wax seal over the traditional cork was interesting. The cork lets in minuscule quantities of oxygen and helps the wine’s development in the bottle. A wax capsule would prevent ingress of oxygen therefore the wine’s development is generated only by what is held inside the bottle, the chemical reactions being different and slower. If there was a possibility of a problem, in 2005, with the too hasty development – and early oxidation – of that vintage, wouldn’t any wine-maker want to slow the maturing process down?